Chase Freedom, Discover and Citi Dividend recently released details of their rotating 5% bonus categories for 2013. If you have one of these cards, you can now sign up for your first quarter bonus program. For your convenience, the chart below summarizes the quarterly bonuses available for each of these cards and should give you an idea of how to maximize your cash back. As of Dec. 17, only Chase has published its bonus categories for the entire year. At this time, only the categories for the first quarter of 2013 are publicly available for the Discover and Citi Dividend cards. However, thanks to some technical shenanigans (viewing the sign up page‘s source code), we can forecast what Discover’s bonus categories may be as well. Beyond Q1, the categories listed below for Discover are not official, and subject to change. Unless otherwise noted below, if a card appears in the table, it indicates that purchases made in the corresponding category will earn a 5% rebate, subject to a bonus cap. 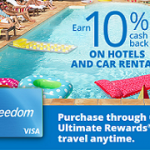 Chase Freedom and Discover will earn 5% on up to $1,500 in bonus category purchases each quarter. Citi Dividend cardholders will also earn 5% in their bonus categories, but are limited to a maximum of a $300 cash rebate per year, unless they received an offer indicating otherwise. Note: This table does not include the excellent US Bank Cash+ Visa Signature card which allows you to earn 5% in two categories that you choose. See this post for more details on that card. Chase Freedom is the most lenient of the 3 cards when it comes to sign up deadlines. As long as you activate your bonus by each quarter’s deadline, you’ll earn your 5% bonus cash back for all category purchases (up to $1,500) you’ve made for the whole quarter. Discover cardholders can sign up online or call 1-800-DISCOVER (1-800-347-2683) to participate in the 5% Cashback bonus program. 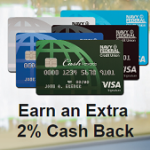 Unlike Chase’s program, you must have signed up for the program before you can begin earning the 5% bonus cashback. Discover cardmembers can begin signing up anytime the month prior to the start of a quarter. For instance, for the quarter of April to June, cardmembers can begin signing up March 1. Citi Dividend cardholders also can sign up online at dividend.quarterlyoffer.citi.com, by logging into their account online and clicking on the 5% cash back offer or by calling 1-800-231-0891. Like Discover, you’ll need to sign up for the bonus program each quarter before your bonus category purchases will be eligible to earn 5%. the FIA successor to the Schwab 2% card, Bank of America Priveleges (now apparently grandfathered because the original ‘Schwab’ version has disappeared from all but one buried corner of the web-site and been replaced by a lesser product also called Priveleges with only a travel benefit but without quarterly rotating bonus categories) owes us what the first quarter 2013 will bring. Maybe Credit Card watcher can check it out.